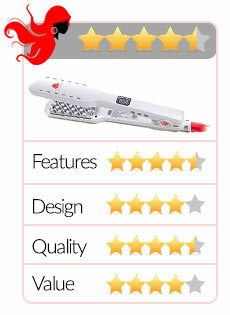 It’s a ground-breaking hair iron that can keep your hair naturally bouncy as well as add volume to it. It’s great for people with thin hair due to damage, aging or disease. After you’ve used the Voloom hair iron, you’ll have fuller hair that looks very healthy and vibrant. The Voloom hair voluminizing iron promises great results. But the question is – does it live up to its promises or is it all hype? Let’s find out in this Voloom review. Add more volume to your hair with the Voloom Hair Volumizing Iron – Available now on Amazon! Before we proceed, it’s necessary to set one thing straight – this hair iron is not a curling iron or a hair straightener. What it does is add volume to the hair. 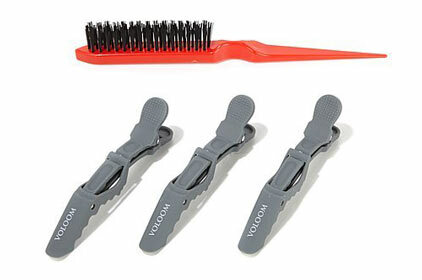 A purchase of the Voloom hair iron includes a section brush, travel case, 3 grip clips and of course the iron itself. The iron is made of high quality materials (mostly metal). It has a temperature display and features an adjustable heating settings. There is also a lock-unlock switch for added safety. The “waffle pattern” on the iron’s plates is what’s responsible for the tool’s ability to make the hair bouncy and have more volume. The plates can heat up real fast so you don’t have to wait a long time before you can start styling your hair. Voloom is made to be used only on hair close to the scalp which is where most of the hair’s natural oils are found. It doesn’t pull the hair and it doesn’t need to be used on the ends of the hair which are the most susceptible to damage. The ceramic-coated plates of this tool also protects the hair and ensures even distribution of heat. Your hair won’t be exposed to very high temperatures – just enough heat to give you great results. Finally, with the ionic technology that is built into this styling tool, it can neutralize the positive ions found in damaged hair, preventing further damage. The Voloom iron is very popular but this is not really surprising. You’ll find that there are lots of advantages going for it. To start with, it does a wonderful job of adding volume and “life” to your hair. So if you have thin hair that looks dull and lifeless, this just might be the solution to your dilemma. Next, it’s very easy to use. Simply take any style you want and then use Voloom as a final step. Using it will only take a few minutes and you’ll have great-looking hair in no time. In addition to adding life to your hair, this voluminizing iron actually helps make the hair healthier. It can also protect the hair from damage. For people who want to add volume to their hair, they sometimes resort to mousses and similar products but while these things work, they can eventually damage the hair due to their chemical contents. Besides, their effects last only a short while. Eventually, they will weigh the hair down and making them look dull and flat. You’ll look younger. Most older people have thinner hair and if this is the case, using the Voloom iron can help you achieve a more youthful appearance. Remember that the hair is a woman’s crowning glory. When you have lush, full and healthy hair, you can take several years off your face. The same is true for women who have hair fall problems or those with naturally thin hair. There’s a learning curve before you can master the Voloom hair tool which we will talk about shortly. The problem is that a few users don’t have the patience to learn how to do it right so they end up with unsatisfactory results. Some have also balked at the price especially since there are cheaper alternatives. To start with, do not use this tool on wet hair. Not even on damp hair. The hair should be completely dry. Brush your hair and ensure there are no tangles. Part it according to your preference and begin with one side by sectioning the upper area. 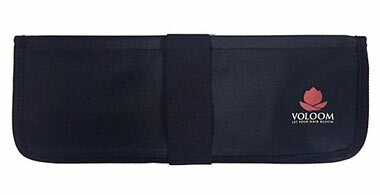 Secure this part using one of the hair clips that come with your purchase. Choose a thin layer of hair close to the face (and scalp) and clamp it with the Voloom iron for 2 seconds. Repeat this to 2x or more. The more clamps you make, the more volume your hair will have. Don’t slide the iron from the root to the tip. 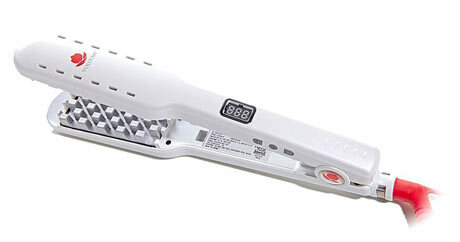 This is not a straightener. Flip the volumized hair and do the same step above for the other layers. Cover the crimped hair with the top layer that you sectioned off earlier then start clamping the layers on the other side. Based on Amazon Voloom reviews, it has garnered a rating of 4.6 stars out of 5, with 80% of the reviewers giving it a full 5 stars. This only shows just how great this product really is. Many have proclaimed that it’s worth every penny they spent because of the wonderful results they got. There are only two complaints about this product on Amazon but they are mostly about the technique needed to get the volume you want. For people with thinning hair or those with flat hair, this is definitely a must. Now you can have fuller hair without the need for harmful chemicals. Ever since I’ve used this product, it has become my go-to tool every time I style my hair and it hasn’t let me down, not even once. You’ll look younger and your hair will look lush and healthy when you use Voloom. 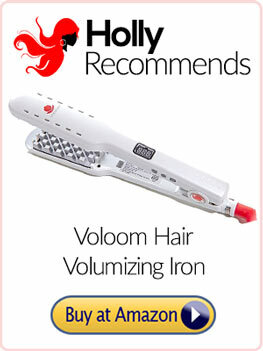 Click Here for the Voloom Hair Volumizing Iron on Amazon!